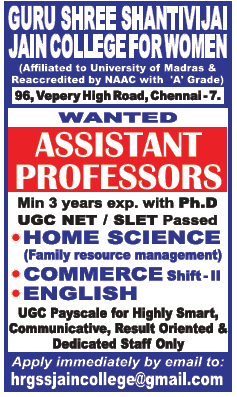 Guru Shree Shantivijai Jain College for Women, Chennai has advertised in THE HINDU newspaper for recruitment of Assistant Professor jobs vacancies. Interested and eligible job aspirants are requested to apply as soon as possible from 07th April 2019. Check out further more details below. GURU SHREE SHANTIVIJAI JAIN COLLEGE FOR WOMEN is founded by Shree Mahaveer Jain Kalyan Sangh(Established in 1967), a Voluntary Charitable Jain Assocaiation, dedicated to the cause of education and social upliftment. The College is named after the great Jain Saint Yogiraj Guru Shree Shanti Vijaiji Maharaj of Mount Abu (India) to mark the memory of his birth centenary celebration. We embarked on a mission with a goal of imparting qualitative education to young women, inculcating moral values and instilling confidence in them. Regular Day College was started in the academic year 1995-96. This is a Self Financing College approved by the State Government & Affiliated to the University of Madras. It is also established and administered as Religious and Linguistic Minority Institution. How to Apply: Interested candidates are requested to send their detailed resume along with copies of certificates and recent PP size photo to the email address mentioned below.